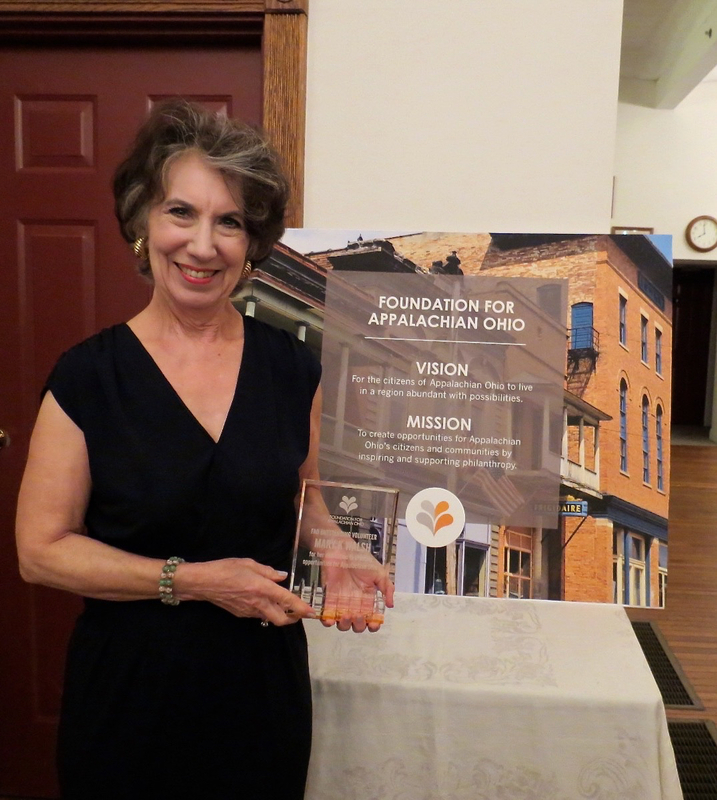 Mary K. Walsh was named 2015 Outstanding Volunteer by the Foundation for Appalachian Ohio. The Foundation for Appalachian Ohio (FAO) recently paid tribute to the legacies FAO honors and the opportunities they create. The Foundation’s mission – to create opportunities for Appalachian Ohio’s citizens and communities by inspiring and supporting philanthropy – would not be possible without the people and the legacies that FAO funds honor and the opportunities made possible by those funds. This work would not be possible without dedicated volunteers. This year, the Foundation celebrated its 2015 Outstanding Volunteer, Mary K. Walsh. A Nelsonville native and a graduate of the former Nelsonville High School, Walsh worked at the Columbus & Southern Ohio Electric Company and AEP for 42 years and retired in 2013 with the title of Community Relations Manager in Corporate Communications. She received the 2015 Outstanding Volunteer award for her assistance on the scholarship committee reviewing applications from talented students throughout the region as well as her efforts to beautify the FAO offices. She spearheaded FAO’s window displays in the former Peoples Bank building on Nelsonville’s Public Square. She installed seating and lighting reminiscent of the building’s former purpose, harkening back to when it was first built. She also installed spotlights on major first floor landmarks, including the bank vault door, a highlight for all who visit the Foundation’s offices. During the holiday season, to coincide with North Pole Nelsonville, an annual holiday celebration on the square, Walsh and longtime friend Karen Pidock installed vintage toy displays and other holiday-themed décor to delight and garner the attention of passersby. Reflecting Walsh’s service on the Foundation’s scholarship committee, two scholarship recipients, John Barba II and Ruby Williams spoke about the impact of the scholarships they received from the Foundation. Both noted how the scholarships they received from the Foundation and those who established them made their pursuit of higher education possible and how it pushes them to pay it forward in the region they call home. For more information about how you can volunteer with the Foundation, please visit http://www.AppalachianOhio.org or call 740-753-1111. Congratulations to Mary K!! Nelsonville and the Foundation for Appalachian Ohio are incredibly lucky to benefit from her talents, passion and commitment to serving the community – something Mary K. lived every day during her tenure with AEP!